Brunei English is a regional dialect of English that is widely spoken in Brunei Darussalam, even though the national language is Malay. Although the lingua franca in the country is generally the local dialect of Malay, all educated people are proficient in English, as it has been the medium of instruction from the fourth year of primary school for nearly thirty years. 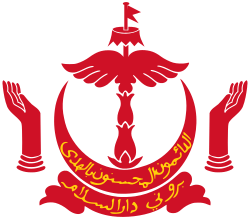 There are various features that make Brunei English distinct: for pronunciation, the sound at the start of a word such as three is often [t] rather than [θ], and there is usually a full vowel rather than [ə] in function words such as as and of; for grammar, furnitures and jewelleries are treated as plural nouns, and there is variable use of the third-person -s suffix on present tense verbs; and for lexis, many words are borrowed from Malay to reflect local customs, including titah (a speech by the Sultan) and tudung (a head scarf). Some of these features are shared with other varieties of Southeast Asian English; but others make Brunei English a distinct variety. There is, of course, substantial variation in the English spoken in Brunei. Two sources of variation are mentioned here: education and ethnicity. There is rather a wide educational divide. Those who attend private schools and the best government schools usually achieve an excellent standard in English; but those who go to less fashionable schools often end up with only rudimentary skills in English. There is also some variation in Brunei English arising from the ethnicity of speakers. Recent research has shown that undergraduates at the University of Brunei Darussalam (UBD) can identify whether a fellow undergraduate is Malay or Chinese on the basis of 10 seconds of spoken English with an accuracy of about 74%, which suggests that the English pronunciation of the two ethnic groups differs to some extent. The consonant at the start of words like thin and thank tends to be pronounced as [t] rather than [θ]. The vowel in function words such as of and that tends to be a full vowel rather than [ə]. Pairs of long and short vowels are merged by some speakers, with the result that beat and bit may be homophones, and similarly fool and full often sound the same. In an investigation of the speech of 53 undergraduates, 14 were found to have the same vowel quality in feast and fist, but the proportion of speakers who merge these two vowels is almost certainly higher for less well-educated speakers. Spelling pronunciation affects some words, so salmon tends to have an [l] in it, and the first syllable of company has [ɒ] rather than [ʌ] for about half of undergraduates at the University of Brunei Darussalam. 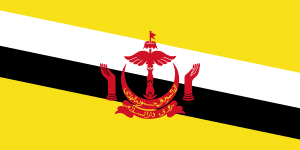 One current change that seems to be taking place is that Brunei English is becoming rhotic, partly influenced by American English and partly influenced by the rhoticity of Brunei Malay. Logically plural nouns are found with an -s suffix, even if they are uncount nouns in other varieties of English. So one finds equipments, infrastructures and jewelleries. This is, of course, also found in a wide range of other New Varieties of English around the world. one of is often followed by a singular noun, so one finds utterances like 'one of the queen were beheaded' and 'he is one of the main character'. Use of the -s suffix on verbs to indicate a 3rd person singular subject is variable. would is often used to indicate something tentative. There is widespread borrowing of words from Malay into Brunei English. These include titah (a speech by the Sultan), sabda (a speech by another member of the Royal Family), tudong (a head-dress worn by women) and puasa ('fasting'). Words for local food are often borrowed from Malay, such as kuih ('a local cake'), as in 'A variety of Malay kuih and sliced fruits will also be served'. Mixing of English and Malay is extremely widespread in informal discourse in Brunei. In fact, an investigation of the language used in an English-medium discussion forum showed that nearly half of all postings were partly or completely in Malay. It is hard to know whether English in Brunei is following an established pattern and emerging as a distinct variety of English or not. However, many of the trends found, such as the use of plural nouns such as equipments and the variable use of the 3rd person singular -s suffix on verbs, seem to be similar to the ways English is used as a lingua franca around the world. Furthermore, the avoidance of vowel reduction in unstressed syllables is consistent with the way English is spoken elsewhere in South-East Asia. So Brunei English may be contributing to the ways that English is evolving around the world today. ↑ Saunders, G. (1994). A History of Brunei. Oxford: Oxford University Press. ↑ Hussainmiya, B. A. (1995). Sultan Omar Ali Saifuddin III: The Making of Brunei Darusslam. Kuala Lumpur: Oxford University Press. ↑ Martin, P. W., & Poedjoesoedarmo, G. (1996). An overview of the language situation in Brunei Darussalam. In P. W. Martin, A. C. K. Ozog & G. Poedjoesoedarmo (eds. ), Language Use and Language Change in Brunei Darussalam (pp. 1–23). Athens, OH: Ohio University Center for International Studies. ↑ Jones, G. (1996). The Brunei education policy in Brunei Darussalam. In P. W. Martin, A. C. K. Ozog & G. Poedjoesoedarmo (eds. ), Language Use and Language Change in Brunei Darussalam (pp. 123–132). Athens, OH: Ohio University Center for International Studies. ↑ Gunn, G. C. (1997). Language, Power, & Ideology in Brunei Darussalam. Athens, OH: Ohio University Center for International Studies. page 155. ↑ Jones, G. M. (2012). Language planning in its historical context in Brunei Darussalam. In E. L. Low & Azirah Hashim (Eds. ), English in Southeast Asia: Features, Policy and Language in Use (pp. 175–187). Amseterdam/Philadelphia: John Benjamins. ↑ Deterding, D., & Salbrina S. (2013). Brunei English: A New Variety in a Multilingual Society. Dordrecht: Springer. p. 17. ↑ Noor Azam (2012). It's not always English: "Duelling Aunties" in Brunei Darussalam. In V. Rapatahana & P. Bunce (eds. ), English Language as Hydra. Bristol: Multilingual Matters. ↑ Coluzzi, P. (2010). Endangered languages in Borneo: a survey among the Iban and Murut (Lun Bawang) in Temburong, Brunei. Oceanic Linguistics, 49(1), 119–143. ↑ Wood, A., Henry, A., Malai Ayla Hj Abd., & Clynes, A. (2011). English in Brunei: “She speaks excellent English” – “No he doesn’t”. In L. J. Zhang, R. Rubdy & L. Alsagoff (Eds. ), Asian Englishes: Changing Perspectives in a Globalized World (pp. 52–66). Singapore: Pearson. ↑ Mossop, J. (1996). Some phonological features of Brunei English. In P. W. Martin, A. C. K. Ozog & G. Poedjoesoedarmo (eds. ), Language Use and Language Change in Brunei Darussalam (pp. 189–208). Athens, OH: Ohio University Center for International Studies. ↑ Deterding, D., & Salbrina S. (2013). Brunei English: A New Variety in a Multilingual Society. Dordrecht: Springer. p. 40. ↑ Salbrina, S. (2006). The vowels of Brunei English: An acoustic investigation. English World-Wide, 27, 247–264. ↑ Deterding, D., & Salbrina S. (2013). Brunei English: A New Variety in a Multilingual Society. Dordrecht: Springer. p. 38. ↑ Deterding, D., & Salbrina S. (2013). Brunei English: A New Variety in a Multilingual Society. Dordrecht: Springer. p. 41. ↑ Salbrina, S., & Deterding, D. (2010). Rhoticity in Brunei English. English World-Wide, 31, 121–137. ↑ Deterding, D., & Salbrina S. (2013). Brunei English: A New Variety in a Multilingual Society. Dordrecht: Springer. p. 53. ↑ Mesthrie, R., & Bhatt, R. M. (2008). World Englishes: The Study of Linguistic varieties, Cambridge: Cambridge University Press. p. 53. ↑ Deterding, D., & Salbrina S. (2013). Brunei English: A New Variety in a Multilingual Society. Dordrecht: Springer. p. 54. ↑ Deterding, D., & Salbrina S. (2013). Brunei English: A New Variety in a Multilingual Society. Dordrecht: Springer. p. 56. ↑ Ho, D. G. E. (2009). Exponents of politeness in Brunei English. World Englishes, 28, 35–51. ↑ Deterding, D., & Salbrina S. (2013). Brunei English: A New Variety in a Multilingual Society. Dordrecht: Springer. p. 94. ↑ McLellan, J., & Noor Azam H-J. (2012). Brunei English. In E. L. Low & Azirah Hashim (Eds. ), English in Southeast Asia: Features, Policy and Language Use (pp. 75-90). Amsterdam: John Benjamins. p. 82. ↑ Deterding, D., & Salbrina S. (2013). Brunei English: A New Variety in a Multilingual Society. Dordrecht: Springer. p. 101. ↑ Deterding, D., & Salbrina S. (2013). Brunei English: A New Variety in a Multilingual Society. Dordrecht: Springer. p. 99. ↑ McLellan, J. (2010). Mixed codes or varieties of English. In A. Kirkpatrick (ed. ), The Routledge Handbook of World Englishes (pp. 425–441). London/New York: Routledge. ↑ Schnieder, E. W. (2007). Postcolonial English: Varieties around the World. Cambridge: Cambridge University Press. ↑ Seidlhofer, B. (2011). Understanding English as a Lingua Franca. Oxford: Oxford University Press. ↑ Deterding, D. (2010). Norms for pronunciation in Southeast Asia. World Englishes, 29(3), 364–367.